Millet flour milling machines for traditional mahangu, ugali, gero, arum, lebelebele etc. Millet flour is prepared from the very fine millet seeds (a type of grass) originating in Africa and later spread into India, and which acts in some regions as staple food, especially in the driest areas of the continents. Various millet seeds such as finger millet, proso millet, kodo millet, Indian barnyard millet and foxtail millet can be used with pearled millet the most widely grown. Millet should be screened to eliminate impurities prior to milling. Millet is normally polished and may be fermented and dried prior to milling when making traditional beer. (This equipment is also available from ABC Hansen.) 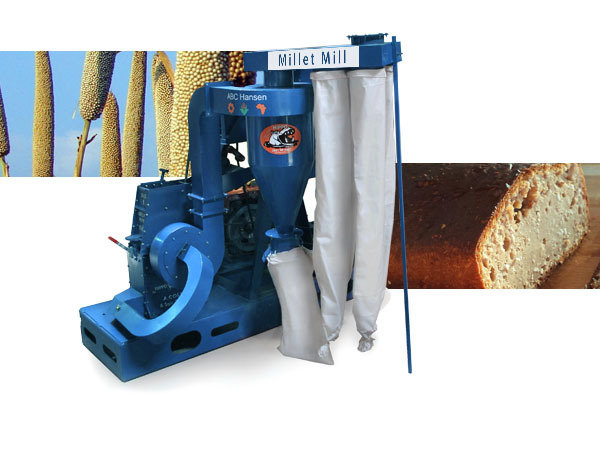 The Universal mill with hammer mill application or a plate application for coarser flour or any of the Hippo hammer mill range of equipment are all good choices to process millet flour at required capacity. When desiring very fine flour, a stone mill is recommended. Millet flour is slightly coarser than bread flour and is being used lately in extrusions for snacks, breakfast cereals, pasta shapes etc. It is recommended to screen out all coarse particles prior to packing when sold commercially as millet flour.